Grifco have come up with a great new device for those commercial / high cycle carparks that don’t need the power of the Grifco S Drive – the Grifco LS Drive is suitable for small multi-tenanted applications with around 12-15 cars. Its low profile (The LS-Drive operator and rail combined is only 150mm high) means it is ideal for carparks with low headroom. It has a modular design and as such a range of accessories can be added to the system if you need to customise performance (e.g. UPS, wireless security keypad, wireless wall transmitter, key isolation box and so on). The LS Drive launched in April 2017 and we’ve been hearing great things from customers who have had one installed in their carpark. It has the perfect mix of power and efficiency to suit carparks that aren’t up and down like a yo-yo every two minutes, but still need reliable, quiet, safe, intelligent door management. Low Profile and easy mounting. Supplied 774ANZ monitored safety beams. Suitably for light commercial / multi tenanted application. Easy Logic Configuration e.g. ‘open only’ for multi-user carparks. Duty cycle 50 / day at 14.2 cm per second. 12 Month / 20,000 cycle warranty which covers the entire operator, not just a “drive unit warranty” which some other manufacturers offer. Extruded, pre-assembled aluminium rail – one piece, black-anodised with a state of the art mounting method and integrated cable management. The Door Doctors are pleased to be able to offer customers the Grifco LS Drive – it offers amazing quality at a very reasonable price. It’s also backed by a full 12 month, 20,000 cycle warranty. 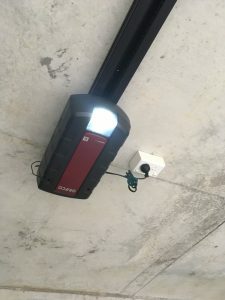 If you’re interested in installing one of these for your sectional door carpark please give us a call on 3299 2992, email us, or click here to fill out a contact form on our website. We’ll get in touch and advise on how our experienced and friendly technicians will be able to help you benefit from the Grifco LS drive. Please click here for a link to the LS Drive instruction manual on the Grifco website.